Is there a stigma associated with looking to third-party options? The pros and cons of outsourcing vs insourcing transcription have been debated for years. In the meantime, both models have remained viable options within various sectors of the health care industry. While experts agree that each approach has its merits, some suggest that misconceptions and lingering controversies surrounding outsourcing can cause organizations to avoid the third-party option, even when it makes sense. "Outsourcing of transcription has gone on for decades, and a lot of it has been right and a lot of it has been wrong," says Brenda Hurley, CMT, AHDI-F, a seasoned health care documentation compliance consultant and educator who's been on both sides of the equation as a medical professional. "Those places where outsourcing was less than ideally handled, that's where the stigma comes from." A recent white paper published by iMedX, an Atlanta-based health information solutions company, suggests that a stigma has developed in the industry that "makes many health care institutions think twice about embracing" outsourcing as an option. The paper, "Turning the Tide on Outsourcing in Transcription," reports that even those organizations that leverage a third party for medical transcription often will feel compelled to hide it or make excuses. Chris Foley, chairman, president, and CEO of iMedX, suggests that these negative perceptions are most commonly found among community hospitals that could face backlash from staff and the community if they eliminate or move jobs outside their facility or region. "Over the years, the larger urban medical centers and academic facilities have most commonly outsourced transcription," he explains. "In contrast, many community hospitals are the largest employers in their town, and the specter of appearing to cause harm to their people is unappealing to hospital management. These facilities are vitally interested in investing in their local communities and creating goodwill." Raghu Vir, president of Georgia-based transcription provider Saince, agrees, emphasizing that when jobs are at stake, the decision can place a lot of stress on managers in community hospitals. "Many times, in these small hospitals, this can become the single most important point in making a decision," he points out, adding that for this reason, many service providers, including Saince, offer employment to in-house medical transcriptionists (MTs) when a facility makes the decision to outsource. While this perception may have thrived in recent years, Kathy Lengel, manager of clinical documentation services and HIM at Lancaster General Health in Pennsylvania, believes changes in operational workflows have turned the tides. "I think there used to be a stigma about outsourcing, but that is no longer the case," she says, adding that in today's health care landscape, it's becoming very much the norm. 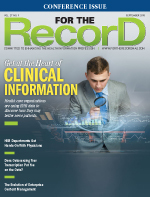 "I believe this is, in part, due to EHRs and the need for quicker turnaround times." Kelly Bortzfield, CMT, AHDI-F, lead health care documentation specialist at Lancaster General, points out that when the organization started planning its outsourcing strategy three to four years ago, other facilities had a tendency to be more secretive about it. "They didn't want other employees or the community to know it was happening," she recalls. "We were very up front with our transcription staff throughout the process so they were aware of every step." In today's lean health care climate, the choice for outsourcing often comes down to dollars and cents, according to Linda Sullivan, CEO of New England Medical Transcription. "Stigma seems like a very strong word," she says about the negative perception. "I think that hospitals like the concept of maintaining their employees—the continuity, loyalty—and want to maintain support of the community, but so many of these tasks are performed more cost-effectively and more efficiently by outsourcing." While community hospitals may hesitate, the statistics speak for themselves regarding the uptake of outsourced transcription. According to Black Book Market Research, 63% of hospitals currently outsource, with that figure expected to grow to 70% by the end of 2015. "Sometimes it's been a hard sell," Sullivan acknowledges. "But it's much more cost effective to outsource transcription. It's historically the lowest it has ever been, and transcription is what we do. It's our sole focus." Some of the angst associated with outsourcing is justifiable. According to Hurley, transitions to outsourced models have not always been handled well. Citing real-life examples, she explains there have been occasions when MTs showed up for work only to be asked by hospital security to clean out their desks and leave the premises. Often, these longtime employees were blindsided, she says. The resulting community backlash can be significant. "When those things occur, then there is a black mark on that hospital," Hurley says. While many transcription vendors offer employment opportunities to hospital MTs who may otherwise lose their jobs to outsourcing arrangements, Foley explains that some only provide independent contractor options. These arrangements are not always optimal and often will give pause to outsourcing decisions. "Many MTs depend on employee benefits, including insurance, paid time off, retirement accounts, etc," he says. "We offer MTs the option to become a full-time employee and receive a wide array of benefits." Bortzfield says having the ability to onboard staff with a service was appealing to Lancaster General as staff wouldn't have to be reassigned or laid off. Although the hospital negotiated as much as possible for MTs during the outsourcing transition, she acknowledges there was some bitterness among the staff that moved to new positions with the vendor. "Overall, the staff were treated well and had as smooth a transition as could be expected," she notes, adding that part-time employees did ultimately lose their benefits and some had to take a pay cut. Negative perceptions regarding security and quality also are outlined in the iMedX report. Many industry professionals agree that the notion that offshoring produces poor quality and lacks security is misplaced. "The offshoring model has matured considerably over the years," Vir says. "We measure the quality of work from global resources by the same yardstick we use to measure the quality of onshore resources. As long as the quality expectations and compensation models that complement those quality standards are the same both onshore and offshore, customers will be happy." Hurley notes that offshore outsourcing remains a divisive issue not only because it's perceived to produce poor quality but also because it sends jobs overseas. "Once upon a time, that was automatically considered a greedy thing to do because you can save some dollars," she explains, adding that cost isn't the only benefit associated with offshoring. Time zone differences allow quicker turnaround times because overseas MTs are completing work while US MTs are sleeping. "There aren't many who would offer to work their shifts," Hurley says. "We're starting to see a blend—some onshore, some offshore." According to Sullivan, quality issues can be found anywhere and a close-knit transcription industry will quickly identify subpar players. While New England Medical Transcription doesn't use offshore MTs, she says, "It doesn't matter if you are overseas or domestic. If your quality is poor, it becomes known." As for security concerns, Foley points to a few highly publicized lapses that gave the industry a bad name. "With current technology, including cloud-based platforms, powerful encryption, secure networks, and compliance with the HITECH Act, we believe that outsourcing is just as secure as in-house transcription," he says. "Some companies continue to subcontract their labor, which could be a cause for concern. The same holds true for quality." Hurley says the perception problems are the result of "all MT services getting lumped together" as sweatshop operations that deliver subpar quality. "That is not at all true," she says. "There are some excellent transcription services out there of all sizes." With so many perceptions and misperceptions floating around about outsourcing transcription, it's important to get an accurate reading of the pros and cons to help health care organizations decide if it's the right fit. In light of new EHR workflows that are shifting documentation processes and decreasing workloads, Lengel says it's a consideration many health care organizations now have to weigh. From her perspective, the primary benefits of outsourcing are the reduced costs associated with equipment, benefits and salaries, and faster turnaround times. "By transferring employees to the outsourced vendor's payroll, the hospital reduces headcount and eliminates the overhead of managing staff," Foley explains, adding that many vendors also furnish state-of-the-art technology for voice capture, speech recognition, EHR integration, and document distribution. "Provided that quality and turnaround times are consistently on target, we believe there are no disadvantages to outsourcing." Flexibility to scale up or down as needed is another advantage, specifically at hospitals where census can fluctuate dramatically during certain times of the year, Vir says. Like any workflow model, outsourcing has its disadvantages. Lengel points to formatting consistency, often created by staff turnover within the outsource provider, being a primary concern. Plus, hospitals lose quality control over the processes when they outsource transcription. To help alleviate turnover concerns, Hurley suggests health care organizations take turnover rates into account when choosing a service provider. She also notes that while many outsource providers are quick to tout quality assurance processes when wooing a client, this cost center is often one of the first to go when there is a need to increase revenue. "When it comes to a service … where is it that you want to cut corners to make more profit? It's always your cost centers, and quality assurance is a cost center," Hurley says. In today's fiscal climate, community hospitals are under enormous pressure to cut costs. Vir says they can't afford to ignore the cost savings potential of outsourcing. "Outsourcing transcription work is definitely a low-hanging fruit that hospital CFOs can take advantage of," he says. Foley believes the onus is on the vendor community to educate hospital leaders that outsourcing will not harm their employees. "At iMedX, we are working hard to educate health care executives about their ability to cut costs by outsourcing while at the same time protecting their employees' well-being," he explains, adding the company offers a Client Alignment Program to effectively transition employees through financial incentives, employee benefits, and robust technology tools. "We call this approach 'humanology'—the combination of humans and technology executed in a culture of caring for our people." Vir believes the best way to overcome misconceptions and negativity is for the service provider to quickly deliver some tangible benefits that impact all of the hospital's stakeholders. "Once the hospital staff start seeing the positive results of outsourcing, any negative feelings are quickly forgotten," he says. Sullivan recommends health care organizations choose a vendor carefully; otherwise, there can be serious repercussions to what is already a painstaking process. "Once you've done it, if you've chosen the wrong vendor, the process to switch is a massive effort," she points out, "particularly for the IT department that has a … to-do list as long as your arm." Keep an eye out for vendors that promote a cooperative culture, Sullivan suggests, adding that vendors should feel more like an extension of the hospital rather than a third party or just another hired hand. Take baby steps at first, Hurley advises, even going so far as "trying out" a vendor in a partial relationship and then growing it from there if it's a fit. "Ease into the transition," she says. "Work out the kinks whether on the MT side or technology side, both of which can be very complicated." Anytime a health care organization brings a third party into the workflow, all pros and cons should be weighed carefully, especially when it comes to documentation, Hurley says. "Let's face it. Health care documentation is extremely critical to the operation of the hospital," she says. "Health care executives must look critically at the risk you take when considering whether to outsource or keep in-house. The risk must be balanced."